Founder Jon Arterton has passed the baton to incomparable choral conductor Allison Beavan, who will, without a doubt, continue the glorious legacy of the renowned Outer Cape Chorale in grand style. 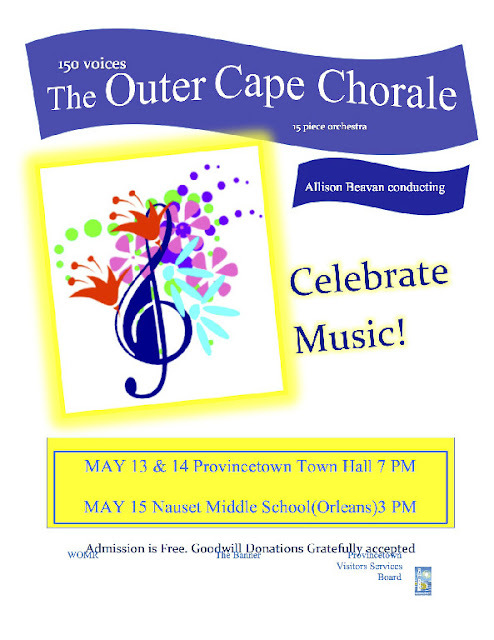 This remarkable 150 voice choir, accompanied by a fine 15 piece orchestra, will perform, free of charge, Friday and Saturday evening at 7 PM in Provincetown, at Town Hall, and Sunday afternoon at 3 PM in Orleans, at the Nauset Middle School. A freewill donation will be taken. This annual concert is always one of the most joyous springtime events on Cape Cod. Don't miss it! Our event could not have gone more smoothly. Huge thanks to the amazing managers from Chicago event venues for their consummate professionalism and outstanding hospitality. We look forward to many more years at this lovely place.